Madysin Hatter is a hard rock band with a balanced mix of influences ranging from ’70s classic rock, as in Led Zeppelin and early Aerosmith, to ’80s hard rock leaning towards the bluesier end of the spectrum. It’s rock with an attitude and while it could serve as a prime candidate for mainstream radio play, it also holds its own with a solid unique rock sound comparable in my mind to artists such as Melissa Ethridge, Sheryl Crow, and with some vocal stylings of Cindi Lauper in terms of artists with strong vocal presence over rock n roll with an attitude. 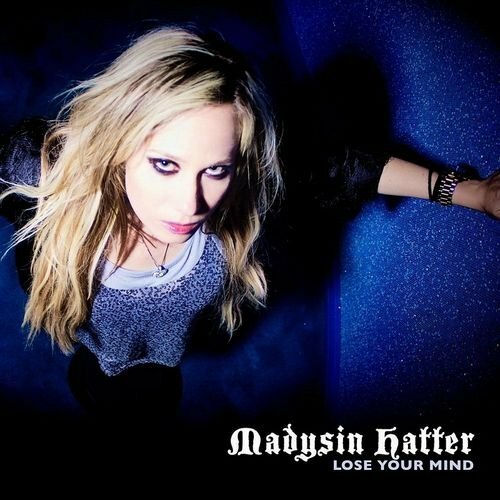 Madysin Hatter is now promoting their new album entitled ‘Lose Your Mind’, released on January 8th, 2016 and it’s available on iTunes as well as for actual physical CD purchase on the Madysin Hatter website. The album focuses on varying tracks with a good mix of tempo and depth of style. I tend to respond better to the fast-paced guitar driven melodies mixed with the cute yet sassy and swanky vocal stylings of Madysin herself, yet I respect some of the more serene lyric driven ballads as well. My favorite song on the album is ‘Black Velvet Snakebite’ because it has the most bark for its bite, as it is catchy in rhythms and Madysin’s vocals are appropriately powerful, pitch perfect, and fun. With their simple yet fun and appropriate themes of gambling, drinking, and just having a good time you can find yourself in great spirits after just one listen. They have the charisma and appeal of a swanky Vegas club that only plays classy rock tunes. The single/video release, and “almost” title track of this album is called ‘Lose My Mind’ and interestingly seems to be the most sane and unidirectional song on this album. Perhaps that makes it most marketable and while it’s a well written song, I do believe some of the other songs do this band more justice in terms of style and uniqueness. ‘Rocky Road’ is a very pretty song which exemplifies the high range of vocals Madysin Hatter is capable of though I really dig the dirtier more bluesy vocals as well. Other memorable songs include ‘Pretty Little Fool’ which seems the most poppy of all the tunes yet has a catchy chorus that is thoroughly enjoyable, and ‘JukeBox Jive’ and ‘Gypsy Rock’ balance the rock eras they are influenced by well and bring the Madysin Hatter flavor into the mix successfully. ‘This Last Time’ is the final song on the album is another well crafted tune that balances strong vocals with driven guitar rhythms and while it has simplistic elements it doesn’t need much else in terms of structure and it does remain one of the more serious, less party-driven tunes on the album. Also, I have witnessed this band live and Madysin herself gives stage presence a good name and with her love of sequins she found a way to successfully bring back sequin rompers in such a way that you are drawn into her flashy world of sparkle and joy. They bring all the ingredients to the table live and with their covers they throw into the mix it’s always a good time to watch. If you appreciate dynamic female vocalists who have plenty of appealing character to their voice and you appreciate straightforward, in-your-face bluesy rock ‘n roll, I recommend checking out the world of Madysin Hatter and purchasing her new album so you too can ‘Lose Your Mind’.